What: The Carnaby Book Exchange, what it says one the tin really you take a book in and swap it for one that takes your fancy. Where: Ground Floor, Kingly Court, Carnaby, London W1. Who: The Book Exchange was organised and continues to be curated by the MA Fashion Curation students at London College of Fashion. Why: The mission statement, "To serve as an incubator for a passion shared, at what will possibly be London’s most diverse book club." Refreshments: A packed lunch – sandwich, crisps, biscuit and your token box of juice and piece of fruit. It has taken me nearly two years of working in the centre of Piccadilly Circus to discover The Carnaby Book Exchange and it only revealed itself to me when I got lost in the labyrinth that is Soho and ended up in Kingly Court. At first appearance, the Carnaby Book Exchange looks like a regular shop the only thing missing is any sign of a sales assistant or a check-out. Once you’ve acknowledged that this is one of these ‘Honesty’ initiatives, that seem to be taking London by storm, and not an abandoned store you get the courage to actually go in. The layout is like a regular cafe but with the added bonus of not having to buy an overpriced coffee for the privilege of sitting on an uncomfortable wooden chair, yes Costa I mean you. The space is very clean and fresh, there’s white bookshelves lining the walls, stuffed with books in no particular order and some comfy chairs to relax in. When you first walk in and sit down you feel a bit like you’re in a goldfish bowl, it’s surprisingly quiet and peaceful in there. It’s evident that fashion students have been involved with designing the space, with gestures to ‘old libraries’ and signs written on easels in a manuscript form, all personal touches that help separate you from the hustle and bustle of central London surrounding you. In terms of exchanging books I may have cheated a little, as I swapped a book I couldn’t for the life of me get into, ‘The Room’ by Emma Donoghue, for something more up my historical street, ‘MI6: The History of the Secret Intelligence Service,’ by Keith Jeffery. Not only can you sit and relax with the book you’re already reading you can swap old books for a new one, obviously. In addition, you can write your recommendations, share your thoughts or just comment on what you think of the exchange itself, which gives an extra book club feel about the place. The Carnaby Book Exchange will probably only be a place to seek refuge in my lunch hour due to its central location, I only venture into Zone 1 on a weekend if really necessary. However, as the winter draws in the desire to sit in Hyde Park or loose fingers to frost bite in St James’ Square wanes somewhat. Therefore, this gem of a discovery will certainly take precedence as a venue, to escape my computer and nagging colleagues, to have a relaxing time-out absorbed in the world of books. Who: The Folio Society, whose mission statement since 1947 has been to create outstanding books in both literary content and physical form. Where: The Guardian Headquarters, Kings Cross. Freebies: Apart from the entire evening? – I got a goody bag with a beautiful book themed notepad and pen, which was lovely. The evening kicked off promptly at 6.30pm in the atrium of the Guardian Headquarters, coat hung up and name ticked off the register I was ready to be bowled over by beautiful books and indeed I was. The Guardian entrance hall had been turned into an Art Gallery with the main illustrations from some of their newer books hung on the wall. The one that really grabbed my attention was a really eerie one of a young girl, which had been created for Fahrenheit 451. 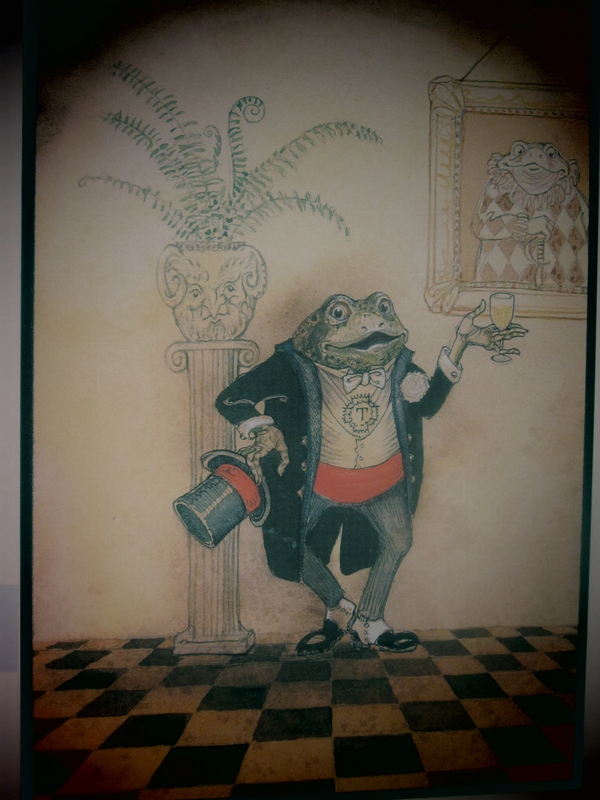 Other notable ones were Toad of Toad Hole for the childhood favourite, The Wind in the Willows and also The Wizard of Oz, (see photos of the illustrations on the left). When the evening’s waiting staff came out with a trolley of what looked like canteen soup dispensers filled with mulled wine, the ‘free bar’ mentality took over and people crushed to form a haphazard queue. Of course I was in the thick of it, because in this kind of situation what else can you do but get the elbows and withering glances out? The mulled win was lovely, I had two glasses because I am festive, before the snacks came out which were pretty good. Anything in miniature always gets me a bit excited so buffets, canapés urmm sushi float my boat big time and I was chuffed to see tiny veal tartlets and little roast beef pies, then the red wine came out but I was a bit sleepy by this point – Christmas always seems to put one into a coma regardless of the scenario. Unfortunately, due to where the event was held, the entrance hall, it was quite difficult to really relax and enjoy yourself above the buzz of the escalators and people coming and going through the rotating doors. This extra noise was also an issue when it came to hearing the special guest speaker, illustrator Graham Baker Smith, who was discussing how he had come about creating the drawings for the new edition of Pinocchio. Although I shuffled closer to hear, the acoustics weren’t great. However, the tidbits I caught were interesting especially about how he’d got into illustration and his current work on a set of short stories by Oscar Wilde. And to be fair there was ample opportunity to talk to him one to one after the reading. The evening itself was slightly disappointing, it did everything it said on the tin but the way it was described I expected something akin to a book themed Christmas market, this was more tea and coffee at a parent teacher evening. If only a small suggestion, the event should have been held in a meeting room or something similar so that people could have at least sat down and looked at the books. I personally had difficulty juggling wine, a small pie and a beautiful book at once. However although, the evening was a bit of a non-starter you couldn’t help but fall in love with The Folio Society’s mission to produce such stunning books. I already want to buy most of them and they really are a great gift for a fellow book lover whatever the time of year. Beautiful Books Rating: 9 – exceptional idea as a gift for anyone! Why did I choose to read this book? I chose it because Stephen Fry described it as, "The most delicious, depraved, inventive, macabre and hilarious literary debut I can think of. More, I want more!” with that introduction there’s no other reason necessary. Refreshments: A full-bodied red wine and a good cheese board. In the Vesuvius Club we are introduced to the frivolous character of Lucifer Box, the most sought after bachelor of the Edwardian belle monde. He is society’s favorite portrait painter, a dandy and a cad, as well Her Majesty’s Secret Services go-to secret agent. So when a group of Britain’s most prominent scientists, known as the ‘Cambridge Four’ begin turning up dead, there is only one man England can rely on. Our fearless agent takes us on a non-stop journey through the underbelly of Edwardian London, via a horse drawn carriage chase through a cemetery, a small pit-stop at a dinner party where we catch up with the crème de la crème of high society and a visit to a funeral parlor. This is all before we are sent over to Naples, to be introduced to the ruined city of Pompeii where we enter Chinese run opium dens and the inner caves of the Vesuvius volcano itself in the run up to the denouement. It’s understandable that Gatiss has such a flair for this genre after his recent successful ventures into writing for such TV series as Sherlock Holmes, Dr Who and The League of Gentleman. The story he weaves is utterly unique and manages to shock the reader continually with its absurd plot twists and turns largely thanks to the books central character, Mr Lucifer Box. In Box, Gatiss has created, one of the most memorable literary characters who will unfortunately never get the recognition he deserves. If you mixed Sherlock Holmes, James Bond and Oscar Wilde together you might come close to understanding the character. Box is shocking and unashamedly so, with quotes like, “Well, what was I to do? For the well-bred gentleman there was clearly only one recourse. I fucked him.” You can’t help but be supremely intrigued by this paradox of an individual. Gatiss’s originality certainly doesn’t end there. One of his strengths as a writer is his penchant for the faintly ridiculous which is emphasized every time you meet one of his characters. We have Box’s handler, a dwarf of a man who liaises with Box in public toilets, missing agent Jocelyn Poop, a stereotypically named Chinese man known as Mr. Lee who runs an opium den, an unlikely sidekick in the beautiful Charlie Jackpot and the ghastly Delilah, Box’s henchwoman who comes across as more of a hunchback of Notre Dame-esque character than a lady. This is but a handful of the people you meet as Lucifer Box deduces and seduces his way to solving the central crime. 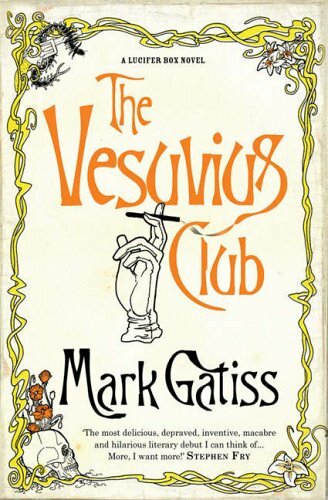 The novel is also supported by the weird and wonderful illustrations by Ian Bass who captures Gatiss’s vivid imagination between the pages and gives you an additional point of entry into the world of the Vesuvius Club. At the end of the day the story of Lucifer Box is unashamedly entertaining and outrageous. It will have you cringing one minute and laughing the next, it’s cheeky and decadent without going too over the top – a definite must read! Extras: And if you fancy listening to the wonderful world of Lucifer Box it’s also available on Audio as well. This is a true story of D-Day. However, instead of stories from the soldiers on the front it takes you behind the scenes into a world of secrets and subterfuge and into the minds of whom the greatest lie was formed in order to convince the Nazis that Calais and Norway, not Normandy were the targets of the largest sea invasion of World War II. Why did I choose to read this book? Ben Macintyre had come to my attention via a friend who is a felllow history lover. I first read his book ‘Agent ZigZag’ which I couldn’t put down and since then I’ve kept a look out for anything new he’s written. Where to read: Somewhere quiet where you can’t be distracted by people or noise – there are a lot of things to keep track of! Refreshments: Pots of tea/coffee and water – stay alert people! Ben Macintyre’s latest book introduces us to the double agents involved in the deception of Germany in the build up to the D-Day landings and puts forward a case for their importance in the plan’s success. 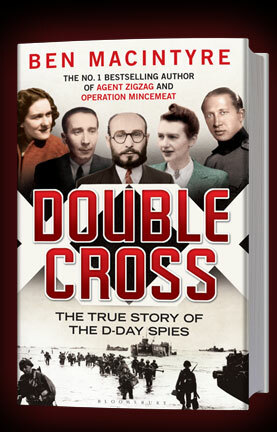 Double Cross focuses on a troop of bizarre individuals that according to him were crucial in the success of this operation. There were five main D-Day agents: a bisexual Peruvian playgirl, a Polish fighter pilot, a rogue Serbian, a wildly imaginative Spaniard with a degree in chicken farming and a Frenchwoman whose obsessive love for her dog almost brought the entire operation crashing down. Under the direction MI6 and with the help of Bletchley Park and Allied Wartime Intelligence we are told the story of how these spies created a web of deception so elaborate that it duped Hitler’s army and helped to carry allied troops across the Channel in relative safety. In this book, Macintyre is taking on a huge and somewhat daunting task and although at times you feel a bit lost at sea, you are comforted by Macintyre’s genuine love and attention to detail for each of his characters. He spins a narrative about the famous five, but also introduces you to some other exceptional characters like Jonny Jebsen, and Tar Robertson not to mention Anthony Blunt who was a high ranking intelligence officer that was passing all this intelligence onto to Soviet Russia. The focus of Macintyre’s writing is definitely the characters rather than the D-Day landings. This gives an entertaining and at times amusing mental image giving you a sense of really getting to know these people. Although not a lot of his content is new Macintyre brings his original style and flair to the subject matter. His writing is entertaining and at times you almost forget you’re reading about War and feel caught in the middle of a James Bond scene. However, for me this is acceptable as Double Cross isn’t a work of detailed military history it’s more a series of biographies to better understand the psychology of the D-Day plan. One of the issue’s I did have, however, when reading this book was remembering who was who. With each of our five odd-ball double agents having a German and a British codename plus an actual name which combined with all the other peripheral agencies and handlers create quite the yellow pages of names to keep track of. This can at times make for quite confusing reading and a lack of focus, which is in contrast to his other books which tend to confront one individual or organization. However, Macintyre does seem to pre-empt this issue with a helpful list of the agent’s different names in a section at the beginning of the book. Also it has to be acknowledged that MacIntyre places too much importance on the roles of these double-agents for the success of the D-Day landings. He endows them with almost a celebrity status and seems to get caught up in the characters stories rather than looking at the facts. At points you can see contradictions in his writing when he simultaneously highlights the fact that these agents were perhaps the greatest threat to D-Day plan versus how pivotal they were. The counter-argument being that the work at Bletchley Park meant the Germans had no idea what was going on anyway and rendered the need for these agents pointless. At the end of the day, Macintyre paints an interesting story of the inner depths of the Allied Intelligence. In the end no one can really say how important the roles of these individuals were but it would be ignorant to suggest that they didn’t play some part in the success of D-Day. Whichever side of the historical coin you’re on these strange and wonderful individuals should still be recognized as unusual heroes and that’s an aspect of the book where Macintyre cannot be faulted. Favorite Character: Juan Pujol aka Garbo aka Agent Arabel, qualified chicken farmer and creator of the most outrageous faux spy network throughout the War. His story is at once captivating and completely insane – look out for his imaginary Welsh band of anti-semites! Extras: In addition to reading the book, I also went to a lecture on Double Cross, by Ben Macintyre himself, at the Churchill Lecture Series. Although there were parts to the lecture I already knew about it was interesting to hear about the research process as well as the personal extras that didn’t make it into the book. Such as, the knowledge that Jonny Jebsen, has a son who now lives in the United States, who had no clue about his father. It was touching to see that he could both know that his father was in fact an unlikely World War II hero but also the Macintyre’s going to visit him to share all his stories. The lecture was a brilliant support to the book and I got my copy signed not to mention a top tip about his next works which will attempt to tackle the Cold War. Rating Book: 7 – good, but wouldn’t recommend to people who aren’t already interested in history! Rating Churchill Lecture: 8 – very good, would recommend everyone to attend one of these lectures whether you’ve read the book or not it’s an excellent evening out for a history buff! Welcome to all book readers, writers and admirers! I am a twenty-something Yorkshire lass living in London who since I can remember have been obsessed with books. I’m not just talking about enjoying the odd read whilst on a sun lounger in Spain, it’s more an all-consuming need to fill my life with other people’s stories, I can’t walk past a bookshop without going in it’s like they call to me and I can’t resist – I’m not saying it’s healthy but at least I’m being honest. I’ll be giving you honest reviews on books, written or talking, as well as, my experiences in bookshops, libraries, cafes not to mention good reading snacks and comfortable reading-wear. In addition, I’ll try to tackle discussions concerning changes in the industry as well as publishing events – I may even start a book club – who knows the world is my oyster, the sky’s the limit and all that jazz, so before it’s too late and I start quoting some unknown philosopher let us begin – I hope you enjoy the ride! You know you want to! Follow this blog and receive notifications of new posts.